1. Inspecting tube sponges near Palancar Caves. 2. Lane snappers on the C-53 wreck. 3. A spotted eagle ray and some permit have a dinner party. 4. The splendid toadfish, found only in Cozumel. Ask the Mayan people who still live there, and they will tell you that there was a time when Isla Cozumel — just minutes away from the Yucatan Peninsula in the Mexican Caribbean — was the traditional Mayan honeymoon island and a temple city with thousands of inhabitants. Today, all that's left of the temples are ruins, but it's easy to see why Mayans who just tied the knot would have loved this place. A sunny island washed by ocean breezes and conveniently close to the Mexican mainland, Cozumel is surrounded by clear cobalt seas — all the elements for romance. It still bears its ancient name, Cuzamil, which is Mayan for "place of swallows." 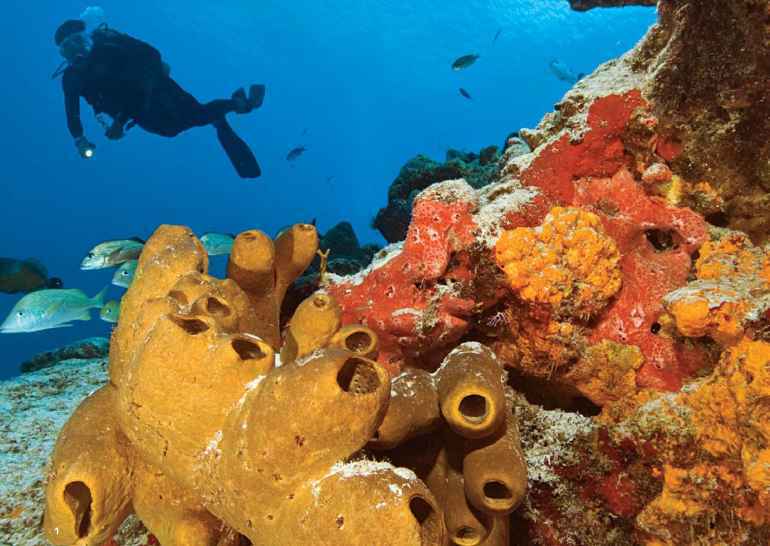 Can you imagine what the ancient Mayans would have thought about Cozumel if they had scuba? AVERAGE WATER TEMP: 76-84°F WHAT TO WEAR: Dive skin or shorty in summer; 3-5 mm fullsuit in winter. AVERAGE VIZ: 100+ feet WHEN TO GO: Year-round; November-May is dry season. 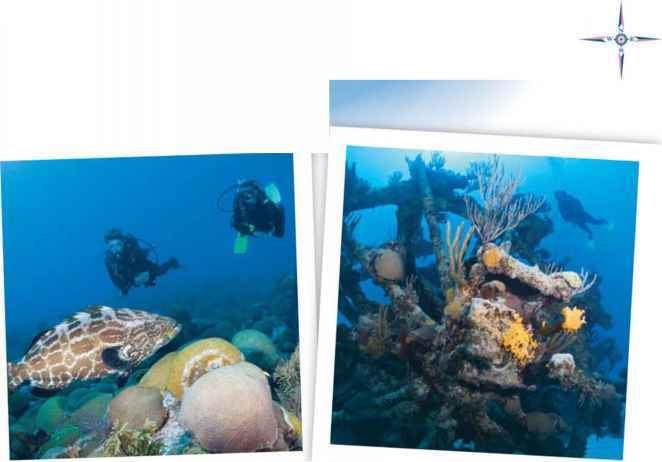 WHAT TO EXPECT: World-famous shallow and deep drift diving along reefs and walls, and the latter offer swim-throughs. Both large boats and "fast boats" available. Inland cave diving is probably the island's best-kept secret; some caves hold Mayan relics. LANGUAGE: Spanish; English widely spoken. TAXES: 15 percent hotel VAT, plus percent lodging tax. ELECTRICITY: 120V, 60 cycles; U.S. appliances work here.TIME ZONE: Same as U.S. Central Time. It wasn't until the 1960s that ocean legend Jacques Cousteau made the first dives on Cozumel reefs. 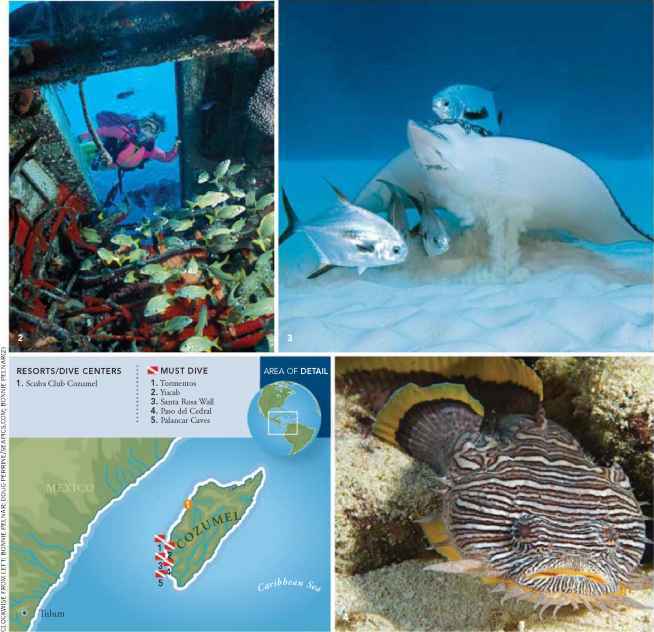 When he did, he found an astounding variety of dropping-to-infinity coral walls, caves and shallow-water reefs, all perfect for that most effortless form of scuba —drift diving. And since the currents that make drift-diving possible also wash in a constant flood of nutrients and pelagic animals, Cozumel dive sites are not only beautiful, they are vibrant with a staggering variety of sea life, from majestic rays and sharks to diminutive coral-dwelling blennies. Cozumel today is superbly equipped to help visitors enjoy diving in the peaceful waters off its western shore. Divers have their choice of fine hotels with docks that allow dive operators to pick up and drop off guests just minutes from their rooms.